Skyfire is an annual March fireworks show held over Lake Burley Griffin in Canberra, Australia since 1989. The event is funded by local radio station FM 104.7, and the display is synchronised to a soundtrack of music broadcast on the station. Skyfire 2018 delivered a magnificent display of fireworks as part of The Enlighten Festival. It's Canberra's biggest night of fireworks - and this year the event turns 30. The fireworks display was 18 minutes of extravagant lights and explosions timed to hits provided by 104.7 including some classics from across the 30 years of Skyfire events. This image belongs to the travel and nature stock photo library. This stock photo of Skyfire 2018 Firework Display over Lake Burley Griffin is available for licensing for commercial and editorial uses including websites, blogs, books, magazines, brochures and advertising. Restrictions may apply for images which contain third party copyrighted material or sensitive subjects. Photos of artwork are for editorial use only. 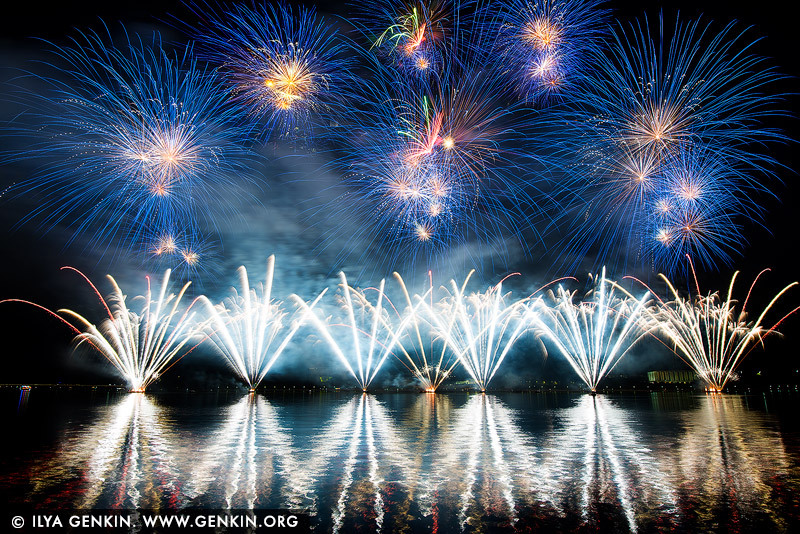 This image id AU-CANBERRA-FIREWORKS-SKYFIRE-0003 of Skyfire 2018 Firework Display over Lake Burley Griffin, is copyrighted © by Ilya Genkin. This is not a public domain image.